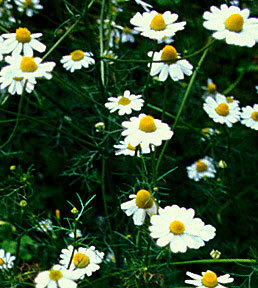 Chamomile grows well in the Boston Mountains. Early settlers dried the flowers to make a tea administered for sleeplessness and to cure cold sores and acute melancholy. They nicknamed it “earth apple” and many attest that it has a taste reminiscent of ripe apples. I like the fact they used it for making compresses to soothe skin inflammation and, interestingly enough, sore eyes and strained vision. They crushed the dried leaves to prepare hot compresses. Medical studies have found that chamomile also relaxes the uterine walls, so homeopathic grandmothers would not allow their granddaughters to drink the tea if they were expecting a child. It also has coumarin and was used for thinning the blood. If you plant chamomile, harvest the flowers each year or you will end up with a meadow of plants in just a few short years. The experimental chef rises up in me from time to time and I have found that a tea made with chamomile, crushed ginger root, and green tea will cure any bout of melancholia. Add lemon or lime zest to enhance, and honey for smoothness. Adding honey helps bring out the natural flavors. This entry was posted in Flora and Fauna, Herb, Medicinal Herb, Recipe and tagged Beverages, Boston Mountains, Chamomile, Flower, Green tea, Herbal tea, Matricaria chamomilla, Tea. Bookmark the permalink. 2 Responses to Chamomile Tea Anybody? Interesting post. I learned a lot about earth apples!